Recognising the presence of mastitis in the udders of cows is the first step towards efficient treatment of the issue. Being able to spot a case before it prevents clinical signs is key to cutting costs and maintaining the health of the cow. Mastitis is the term used to describe infection of the mammary gland. In cows each quarter can be seen as a separate mammary gland – so having an infection in one quarter does not mean that the other three quarters are also affected. Bacterial invasion of the teat canal and consequently the teat cistern results in mastitis infection. There are a range of pathogens that can cause mastitis; some of the most commonly seen are S. aureus, E. coli, S. spp., Salmonella spp. and candida. As in all cases of mastitis the pathogen must gain entry to the quarter; in most cases this is through the teat canal. Unhygienic conditions in the parlour, dirty or wet bedding, and cross-contamination of milking equipment can all be routes of infection for the pathogen. Furthermore, mechanical damage to the quarter i.e. a kick or fall, leading to damage to the quarter can reduce the general health of that quarter and lead to opportunistic infection of pathogens. · Ensure all bedding is clean and dry; use anti-bacterial sawdust for mats, brush off soiled or wet beds at least twice a day to prevent cows lying in muck. Use a hot water bath disinfectant to wash the quarters of the cow before milking; iodine solution in a hot water bucket with a clean cloth to wash the bags. Change the bath at least every 50 cows. · Use an iodine post-milking spray. This spray is used immediately after milking on the teats; the teat canal stays open and susceptible to invasion for at least 30 minutes after being milked, the iodine spray should prevent pathogens from entering. · Clean all milking equipment thoroughly before and after milking with a strong disinfectant. When the pathogen enter the quarter they start to replicate and reproduce, releasing toxins and starting to cause signs of clinical disease that we associate with mastitis. The earliest signs to notice are redness, swelling, heat and hardness of the affected quarter. These signs are shown due to the cow’s immune system reaction to the pathogens being present in the quarter. The immune system typically causes inflammation to occur, allowing more immune cells into the quarter – this shows as swelling, hardness and redness. As well as this the temperature of the affected tissue is raised, allowing increased rate of metabolism for the immune cells – this shows as heat when palpated. At the stage the infection has not really taken a hold of the quarter and hence this is the ideal time to treat mastitis in order to achieve best results. The population of pathogens is at its lowest and there is minimal damage to the secretory cells lining the cistern and so the anti-biotics administered should have maximal effect. Therefore when milking, it is essential to feel the quarters both before and after the cow has been milked – if any quarters feel unusually hard, look red, feel hot or swollen, then they are probably suffering from a mastitis infection. If the infection goes unrecognised at stage 2, the pathogens will continue to reproduce and more toxins will be released causing damage to the cells inside the quarter. Immune cells will attempt to overcome the infection but in most cases many of them will die. The dead immune cells are visible in the infected milk as thick clots or puss. At this stage if the teat is stripped out before being milked, often there will be thick clots present, sometimes flakes, blood, and mucus or just off-coloured milk. These are the most characteristic signs of mastitis and although useful to know to be able to recognise, at this stage of infection treatment is much less effective than that of treating during step 2 of infection. Following these signs if the infection is not treated then a decrease in yield may occur as well as weight loss and generally unwell signs such as lack of appetite or lethargy and temperature. In the picture above you can see a large clot surrounded by white milk. This cow came into the parlour and kicked slightly when I touched her back right quarter, the teat felt hard and the quarter slightly swollen. 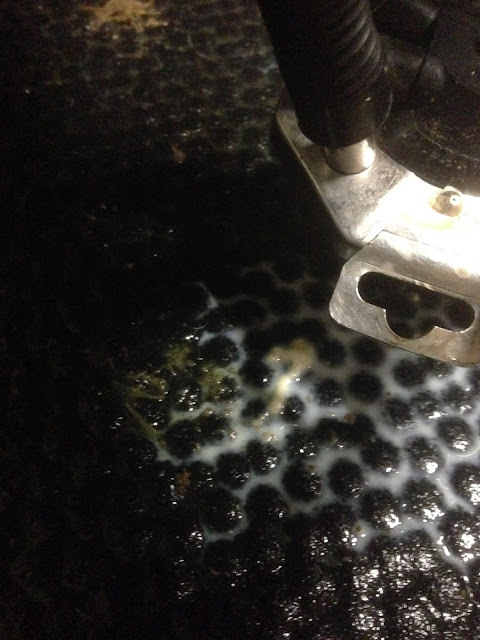 I stripped the teat out and found this clot – to ensure of hygiene I then sprayed the floor with iodine, put the milk onto sample to collect it after milk ing and sprayed up the back left unit on the cluster with iodine. I used a tetra-delta anti-biotic tube to treat the quarter and after 12 hours the clots had reduced significantly.